Nathan Seward, 24, 2nd mate and bosun, mends the main sail in preparation for the afternoon’s cruise. 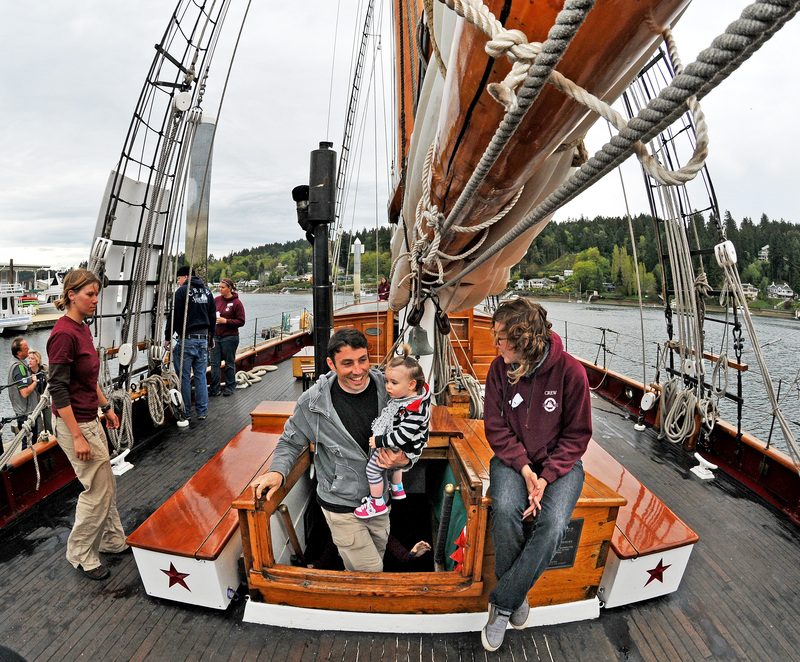 The 133-foot schooner docked in Gig Harbor Saturday for tours and a cruise. The sight of a tall ship conjures up images of harpoons, cannons and one-eyed pirates, barely able to stay upright with only a peg for a leg. So when a visitor asked Julie Mcpherson where the cannons were, she laughed. 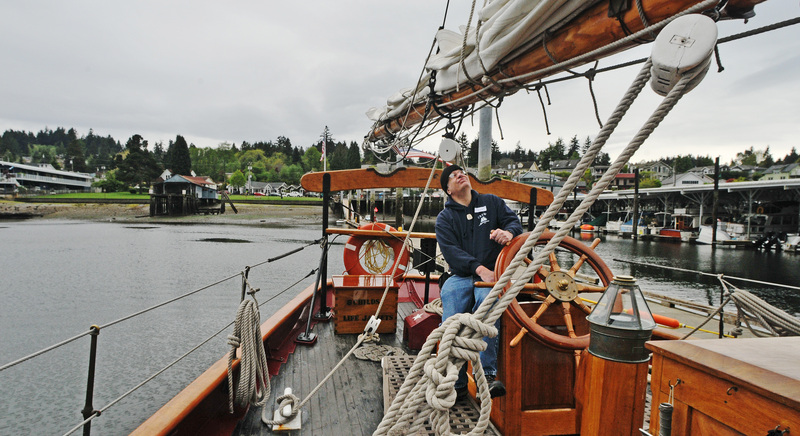 “There are none,” Mcpherson said of the 133-foot “Adventuress” docked in Gig Harbor Saturday opened for public tours. 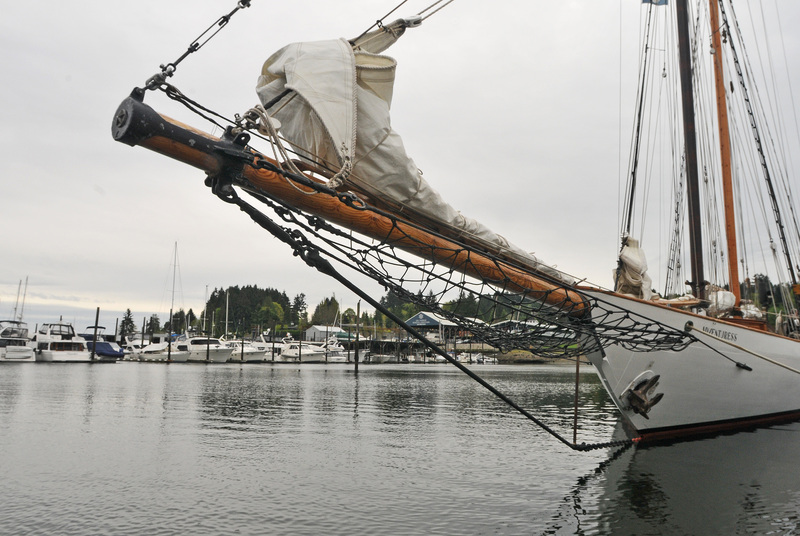 The gaff-rigged schooner out of Port Townsend, Wash., is celebrating its centennial year doing what it has done since 1988: being a classroom at sea for schoolchildren around the Puget Sound. She is also a floating monument to a sailing past so entwined with West Coast maritime history. Its crew cheerfully answered guests’ questions about the tall ship’s history and visitors, young and old, were just as equally enthused. Zorione Parry, 1, is intrigued by the ship’s 110-foot mast. Anthony Parry, of Fircrest, enjoying the tour of the tall ship with his daughter Zorione. “It is also over a hundred years old,” her father Travis added. 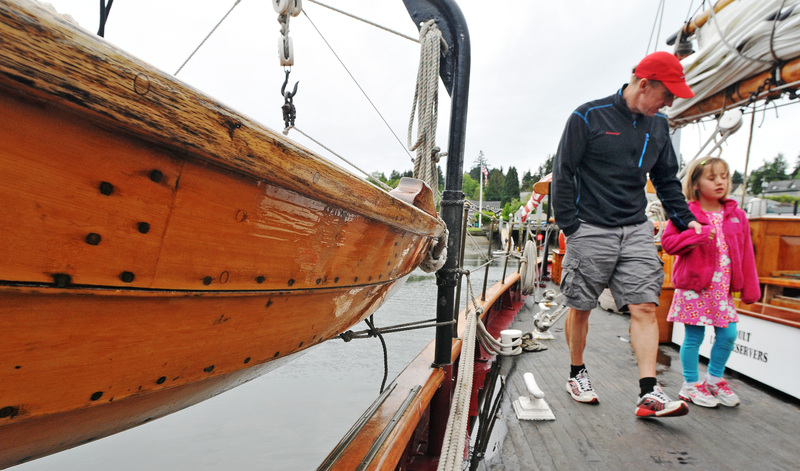 As dozens of visitors walked the dock at Jerisich Park in downtown Gig Harbor to climb aboard the historic schooner, it often felt like a family gathering. “Come on aboard,” bellowed Moon Jelly Barkley, a volunteer with short-cropped blond hair, greeting guests as they approached the ship’s ladder. It was as if she was welcoming family to her backyard barbecue. 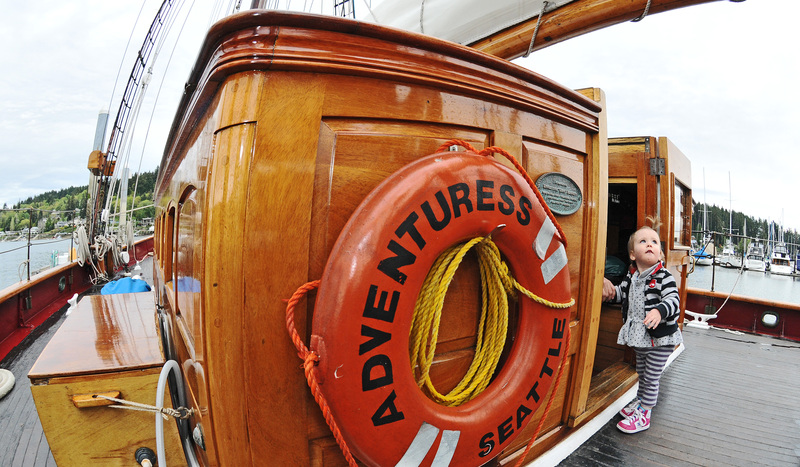 On deck, shipboard educator Aimee Shafner animatedly showed her two cousins Chloe, 8, and Sophie, 6, both of Gig Harbor, one of the 110-foot masts. The two girls had gone down to the waterfront with their parents Scott and Julie Shafner to see their cousin. Aimee Shafner, right, explaining to her two younger cousins Sophie, 6, second from right, and Chloe, 8, middle, the rigging and sails on the ship. This is exactly what Sound Experience, a non-profit out of Port Townsend, Wash., and owner of the “Adventuress,” is all about. According to its website, the group was founded in 1988 to help protect the Puget Sound through education and awareness. The “Adventuress” started out as a luxury schooner for John Borden II of Chicago, founder of the Yellow Cab Company. The ship itself was built in 1913 as a luxury schooner by John Borden II of Chicago, founder of the Yellow Cab Company. A year later, Borden sold the ship to the San Francisco Bar Pilot’s Association where it was “de-rigged for a work boat.” The vessel’s life of luxury had come to an abrupt end. The next 35 years meant plying the treacherous waters of the Farallon Islands, a group of islands 30 miles off the coast of San Francisco, Calif., as a pilot . By the 1950s she had been replaced by sturdier and more modern vessels. Ten years later, she finds her way to Seattle. This rich and colorful history has seduced just about every person working aboard — its sleek classic design a siren’s call to sailors everywhere. The schooner has a full-time crew of 13 and an army of volunteers who help any way they can while the ship is docked or at sea. Joe Bartlett, 59, who lives by the Key Center on the Key Peninsula, says that being a volunteer “is a nice way to own a boat. “And without the payments,” Bartlett added laughing. But the former Coastguard sailor said he is happiest when he is aboard. 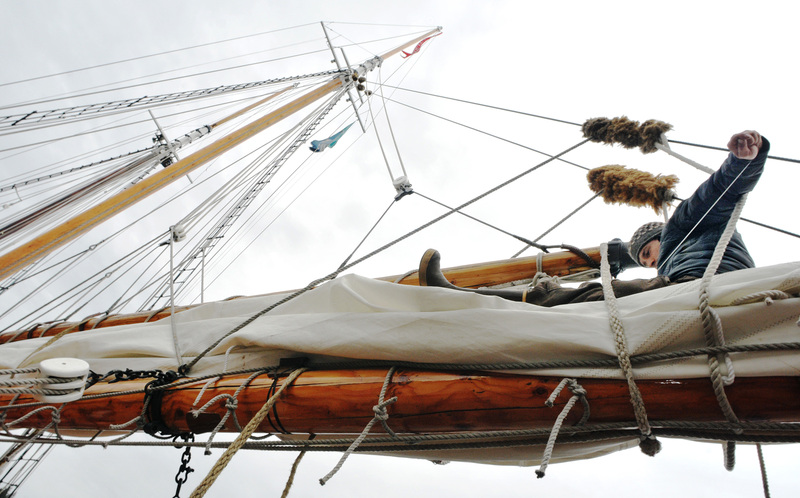 He said he sails on the schooner “whenever he can,” scheduling 4- to-5 trips a year around his work. “I am happy doing this,” he adds. 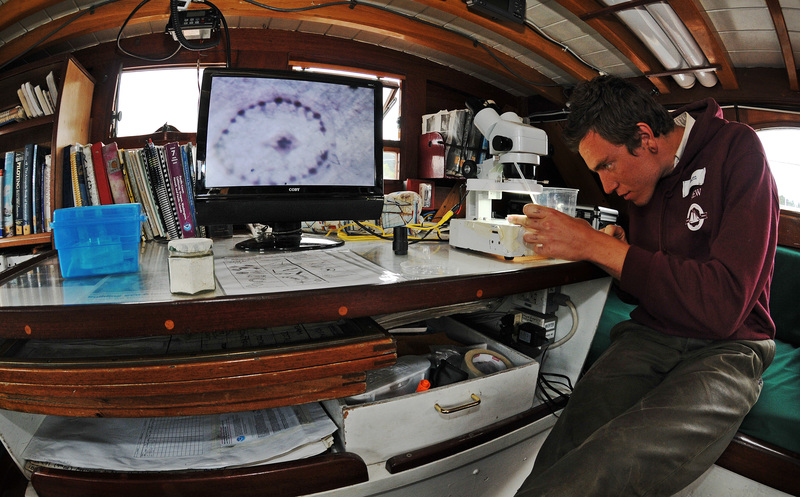 Sam Hilgartner, a shipboard educator, views plankton species through a microscope in the main galley of the ship. But at the heart of it: “I just really wanted to sail,” Hilgartner said. 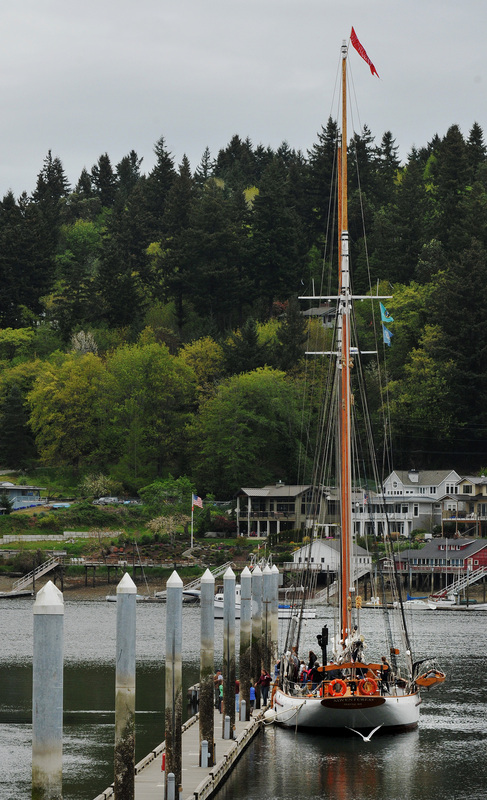 Nathan Seward mends a sail perched high on one of the main sail booms with a Gig Harbor marina in the background. Visitors were able to admire the ship’s woodwork as they walked the deck. 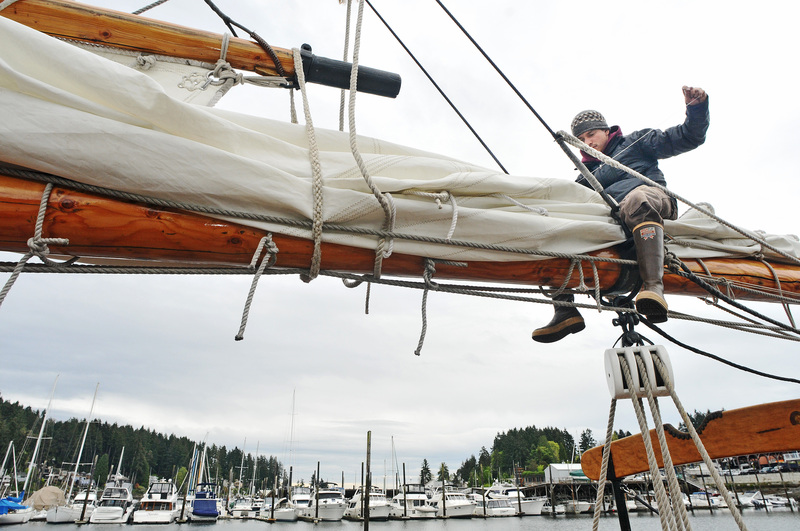 Perched high on the main sail boom, Nathan Seward, 24, of Port Townsend, mends a portion of the sail in preparation for the afternoon’s cruise. Seward, the 2nd mate and bosun, primarily maintains the rigs and sails of the ship, but is also the “random handyman,” he said. Like many of his colleagues, he stumbled on the tall ship, fell in love with it, and now works aboard as one of the crew. Quarters are tight below deck of the 133-foot schooner. “Is this really my job?” Whitemore said she would wonder at times as she looks around the deck of the historic schooner. “It incorporates people from all backgrounds. It brings out something unique out of each one. It is a special place to work. “There is nothing I would rather be doing,” she adds. FOR MORE INFORMATION: Call Sound Experience at 360-379-0438 or go online at http://www.soundexp.org. 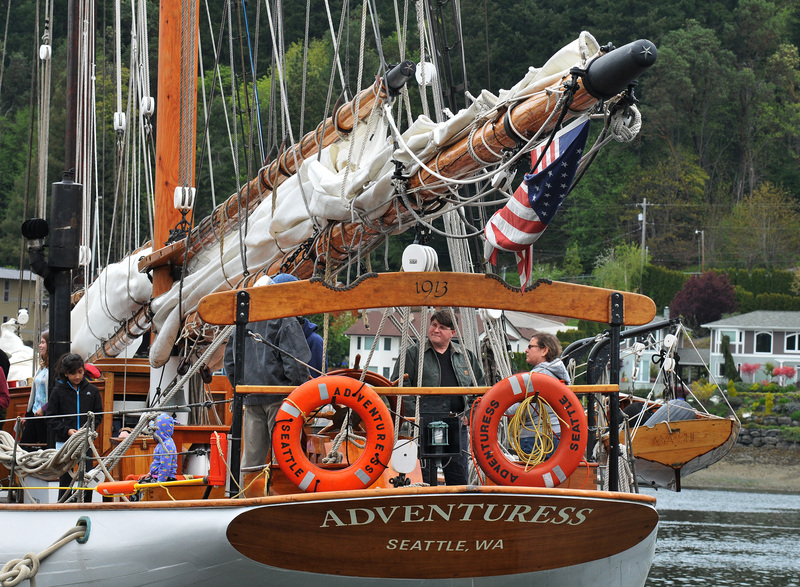 The “Adventuress” will be docked in Tacoma for tours and another public sail.